I made two trips to Brazos Bend State Park in the week before Christmas. One day was mild and windy, the other day was freezing cold. Well, not exactly freezing, but 38 deg F at daybreak is pretty danged cold. The first trip I discovered a big part of the park I had never explored; the second trip I learned I needed gloves. On the first trip at Creekfield Lake I found this American Bittern. 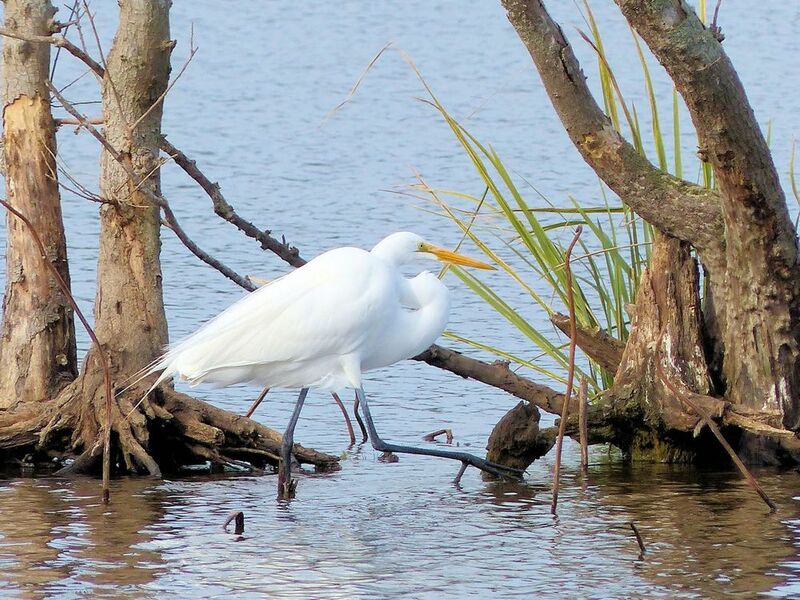 They are generally shy and secretive; birders are rather proud to have seen them. I have photographed one near 40-acre lake several times. But that one has been standing in green vegetation and looks silly trying to hide. This was the first time I had seen a Bittern at Creekfield. And he was right out in the open. Generally, these birds are sleek and skinny. It was not cold; this was the mild day, but he puffed up maybe because he was anxious I was so close. Trying to look bigger to scare me. The Black Vultures are still hanging out at Creekfield. The piers are getting progressively whiter. Now, these guy are scary. I tried to get some close ups of his feet. Maybe next time. If they don't leave I may have to do a whole photo essay on them. There were the usual birds around. Buy. something new for me were these Blue-winged Teal Ducks. There were quiet a few about, and the male is more colorful. But I liked the way these three females perched on the log. Birds do the one-legged thing a lot. I did see a Coot and a Glossy Ibis with definite injured legs. It must be fairly common, but these gals were just stretching and posing. I want to show you how I am progressing with Birds in Flight. No need to show this full size, believe me, it looks better the smaller the photo and if you squint. When they take flight, it startles me and I put the camera down. I need to get over this. 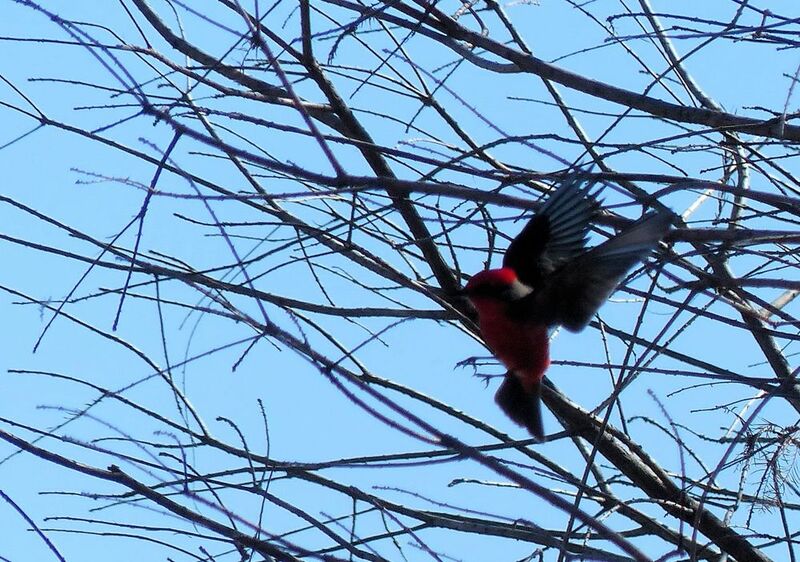 But usually the photo is just a blur, this one is at least recognizable as a BIRD. After a while I went over to Elm Lake. I have only been there once before but it has changed a lot! We had some recent rain; they have done things with the flood gates and the lake was much higher and ... bluer! It was a bit odd to see these two sharing a log. But, hey, unlikely friendships. 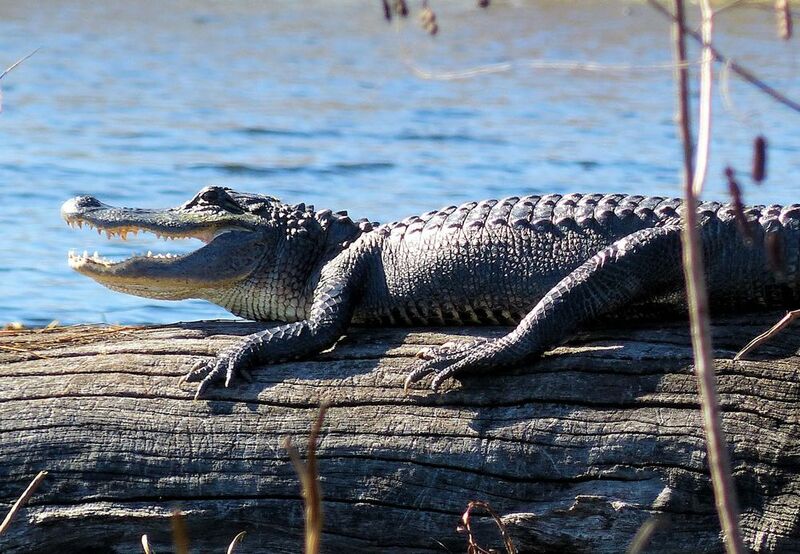 Notice the alligator is wearing a tag on his tail. 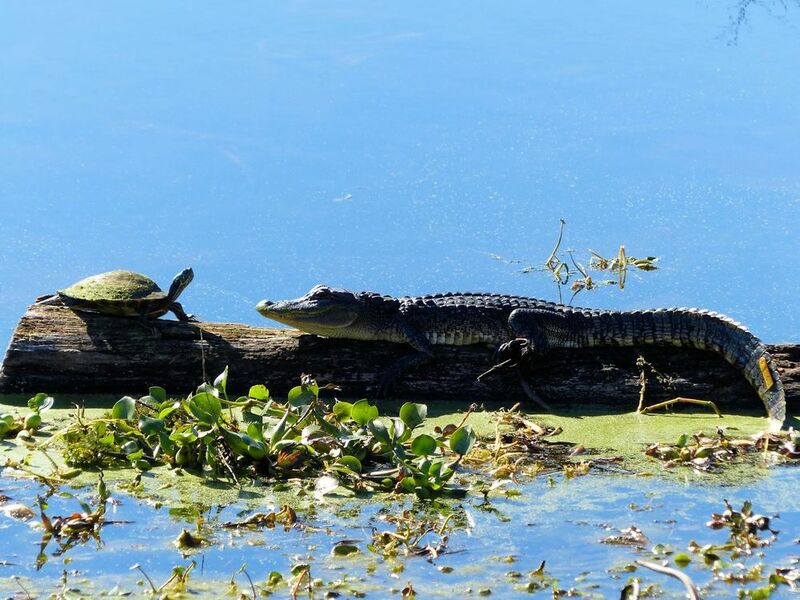 This is a rather large turtle and a medium sized alligator. I estimate the 'gator was about 6 feet long. There were several around, taking advantage of the sunny day. Now, this is a big alligator. And then I saw a flash of red. It was not a Cardinal. 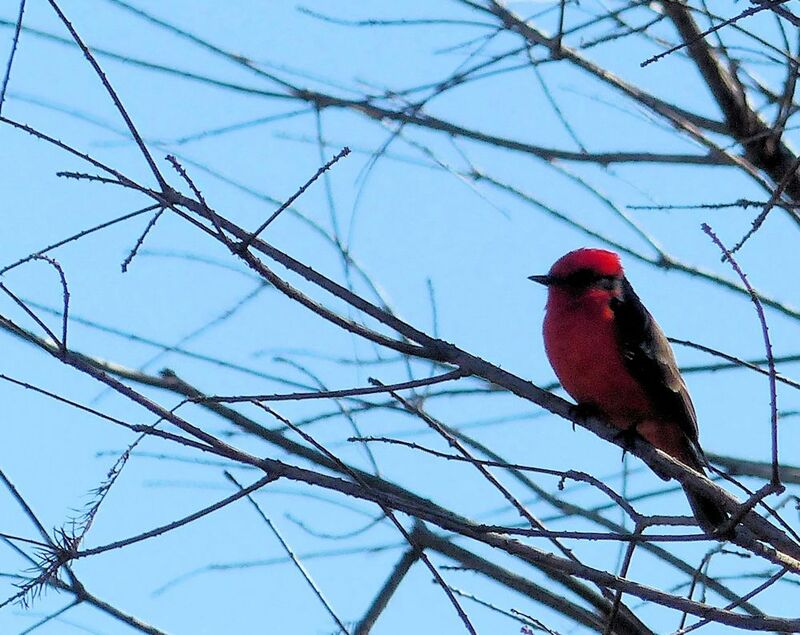 The Vermillion Flycatcher was really hard to photograph. One, all those branches just confuse the heck out of my auto-focus. And the danged bird will not sit still; he is darting off catching insects and coming back constantly. Thinking about it, it must take a LOT of flies and insects to fill this guy up every day. I caught a glimpse of one at Anahuac last time but no luck in get a capture. This time I was lucky. Now, this is one I am proud of, too. 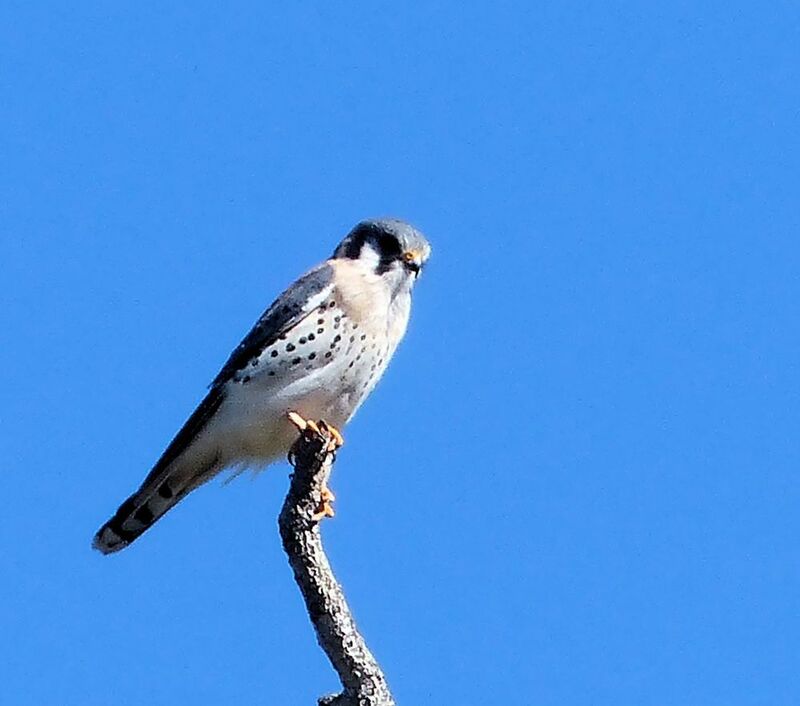 The above is an American Kestrel . It is a small falcon, sometimes known as a Sparrow Hawk. This might be a female due to the buffy color around the neck. I didn't get a good look at it in flight since I was staring into the sun. The recent rain helped out with 40-acre Lake as well. Most of the vegetation has died out and these pictures are from the cold morning. There was NO wind, the lake was like glass. 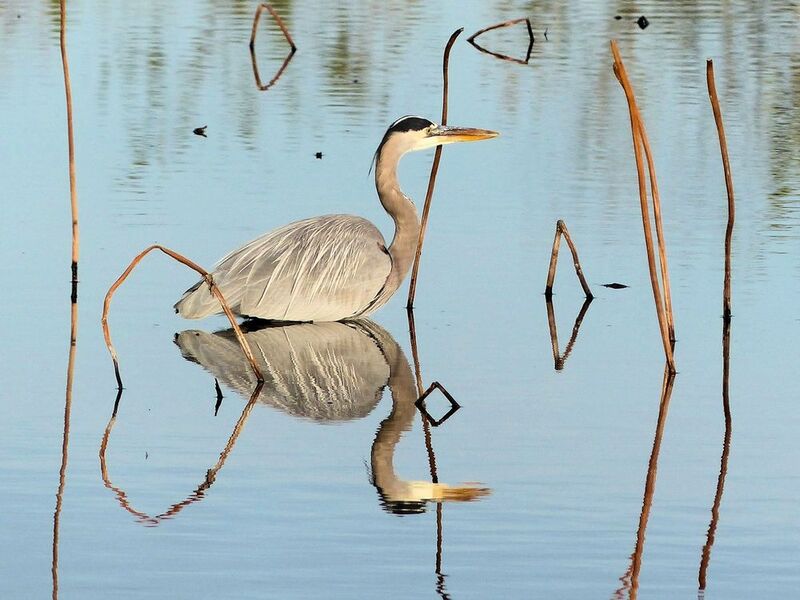 I must have taken dozens of this Great Blue Heron. Why? He wasn't moving much and I was braced on the pier railing, but he would not leave the vicinity of those annoying sticks. And I was hoping he was hungry and I could get a some action for you! This is some action, but you know what I mean! 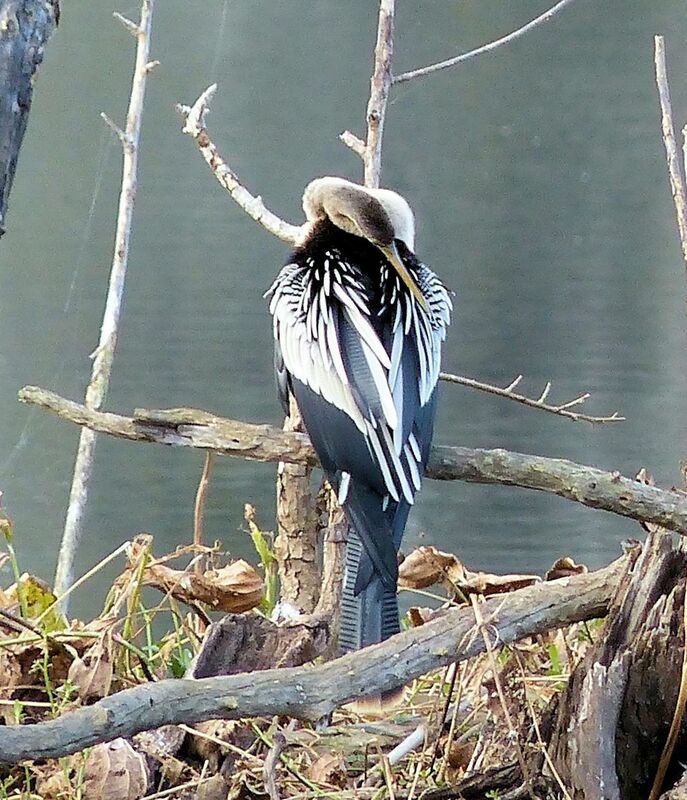 And to close out this adventure, I give you a resting Anhinga. There are some more in the Galleries, but this was a rather nice composition. Nature knows how to show its best features. So, what did you do on your Christmas vacation?